Left to right, back row: Mr John Maher, Professor Séamus Ó Duilearga, Dr Richard J Hayes, Senator Edward A McGuire, Professor Dónal Ó Corcora, Mr Muiris Ó Muimhneacháin, Secretary, Department of An Taoiseach, Dr William O Sullivan, Secretary, Arts Council. Left to right, front row: Mr Thomas McGreevy, Monsignor Pádraig de Brún, Taoiseach Eamon de Valera, TD, Mr Patrick J Little, TD, Director, Mr John A Costello SC, TD, the Earl of Rosse, Ms Muriel Gahan. Inset Dr Alfred Chester Beatty. It is a matter of great gratification that we have, in this period of strife and stress, such a unanimous and, I may say, enthusiastic support for a Bill dealing with matters of the spirit, the fine arts. [...] For me, it is the fulfilment of a personal ambition going back over many years. I have no doubt that the way in which this Bill has been received both in the Dáil and in the Seanad—reflecting as it does unanimous opinions of all Parties, and therefore the unanimous opinion of the Irish people, that this art council should be set up and set to work immediately—will be a source of great strength and encouragement to the director of the council when it is set up. 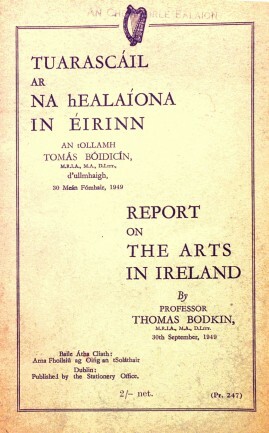 The Arts Council (An Chomhairle Ealaíon) consisted of a board and staff members. Under the terms of the Arts Act, 1951, the appointment of the Director was made by the President on the 4 December 1951 and the appointment of ordinary members by the Government took place on the same date. On 2 January 1952 the Council took up offices at 45 St Stephen’s Green, Dublin 2. 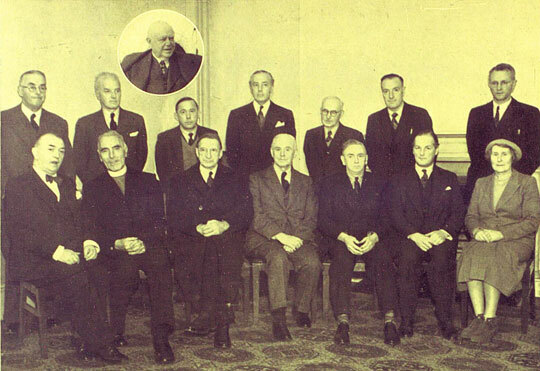 The first formal meeting of members took place on the 10 January 1952. Its first full meeting (with co-opted members) took place on 25 January 1952 and was attended by Taoiseach Eamon de Valera TD and John A Costello SC TD, leader of the Opposition. Both men addressed the Council and wished members success in their work. Providing direct financial assistance or financial assistance by way of guarantee against loss to art organisations toward their artistic projects or programmes, such as exhibitions, plays, operas, drama festivals, recitals, productions, concerts, ballets, lectures and publications. Mounting exhibitions of Irish artists in Ireland as well as overseas and bringing foreign exhibitions to Ireland. Initiating and operating a programme of schemes, such as the joint-purchase or halls in rural areas schemes. Initiating and operating a range of awards whereby financial assistance is directly awarded to individuals by way of scholarships, fellowships, competitions or prizes. Providing advice to government and government departments and its agencies on artistic matters. Members of the Council may also make representations to various bodies without their advice being sought. Administration of trust funds. The Arts Council, having accepted gifts of money to establish trusts of an artistic nature under the terms of Arts Act 1951, administers the funds of trusts, such as the William J.B. Macaulay Foundation, the New York Irish Institute fund and the Denis Devlin Memorial foundation. Provision of information service. The Secretary of the Arts Council answers general enquiries from Ireland and abroad about artistic activities and provides advice to the general public on artistic matters. The State endowment for the first full financial year (1 April 1952–31 March 1953) was £10,000.